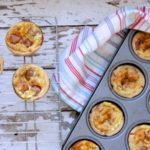 Ideal for batch baking, these tasty kid-friendly mini quiches with smoky sausage freeze like a dream and are a great fuss-free sandwich alternative for kids’ packed lunches. Sam and Arlo absolutely love them, and I absolutely love the fact that I can just reach into the freezer and stick them straight into their lunch boxes. I am on a packed lunch ROLL this term. Are they hard to make? Nope! I never bother making my own pastry, so I’ve just used a pack of ready-rolled shortcrust pastry from Lidl which worked a treat for this recipe. Time-saving ingredients like this are a busy family cook’s best friend. If you don’t have a pastry cutter the right size, just find a jam jar or a tin of beans instead. 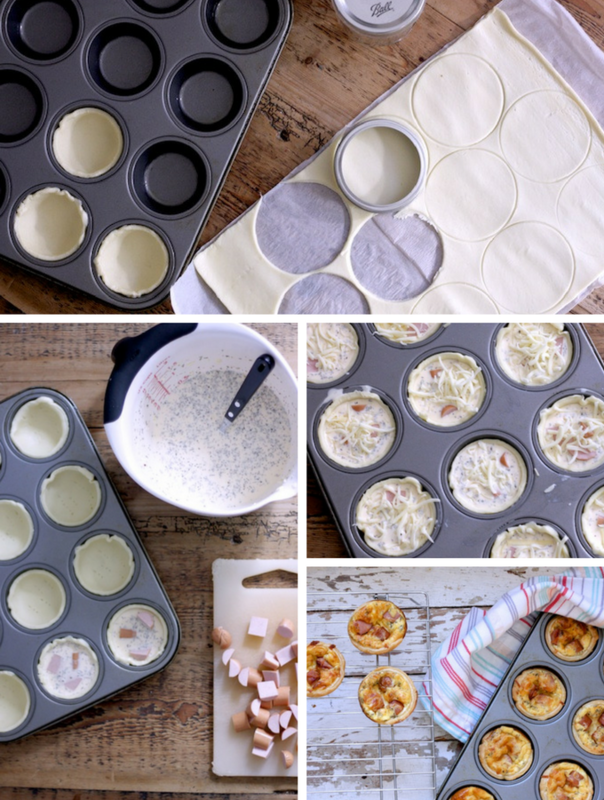 Make sure you use a nice deep holed muffin tin so you get plenty of filling in your quiches. 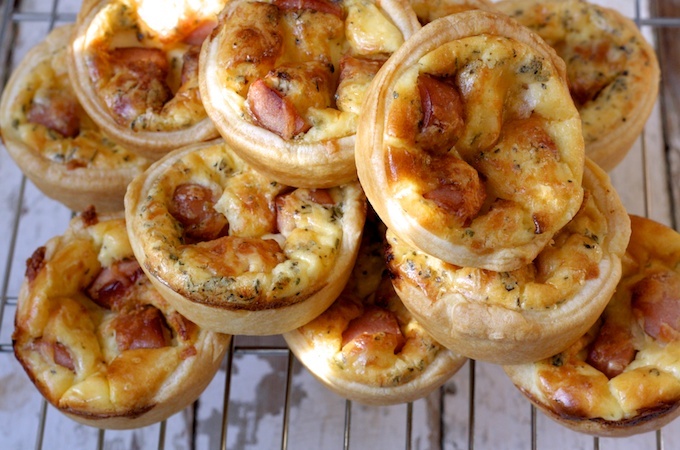 Jam tart-sized quiches are not going to fill anyone up! I’ve used Bockwurst sausage from Lidl, but of course you could use anything at all that your child finds appealing. Cooked chicken pieces, bacon, cherry tomatoes, sweetcorn. These are highly customisable as well as being highly lunchable! They are also great fun to make WITH the kids if you’re in the mood for a spot of cooking with them. I was going to make a video of making the quiches with the boys at the weekend, but I was so tired I couldn’t handle the idea at all. So I made this batch in the peace and quiet of my kitchen on Monday when they were safely tucked up at school. You really have to be in the zone for cooking with kids! Pre-heat the oven to gas 5. Grease a 12 hole muffin tin. Unroll the pastry and cut out 12 circles using a pastry cutter slightly larger than the size of the muffin tin holes. I used a jam jar lid to stamp out mine. If there's enough leftovers you might be able to get another couple of discs worth. Press each disc firmly into the holes of the tin until filled and then pop into the fridge to chill while you make the filling. In a bowl mix together the eggs, creme fraiche, grated cheese, Italian herbs and a few twists of black pepper. Take the pastry cases out of the fridge and evenly divide the mixture between the holes. Pop a few chunks of chopped sausage into each quiche and then finish with a little scattering of grated mozzarella. Bake in the over for around 20 mins until golden and bubbling. 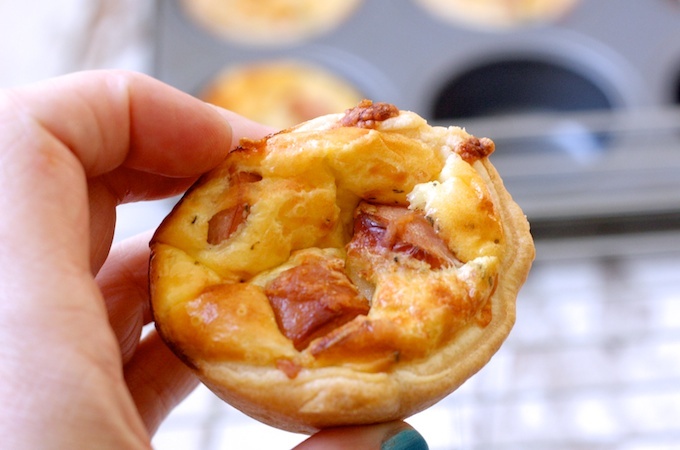 Allow to cool and then carefully ease each mini quiche out of the tin using a small knife. Put them into a sealed container and keep in the fridge for 3-5 days, or wrap individually in cling film and freeze until needed. They will happily defrost in a lunchbox and keep the rest of the contents nice and chilled. « 5 Bonfire Night Recipes – Bring out the bangers! What a lovely idea. I like the thought of having just a little bit of pastry, rather than the amount you’d get on a great big wedge of quiche – as it always leaves me feeling a bit grotty afterwards. 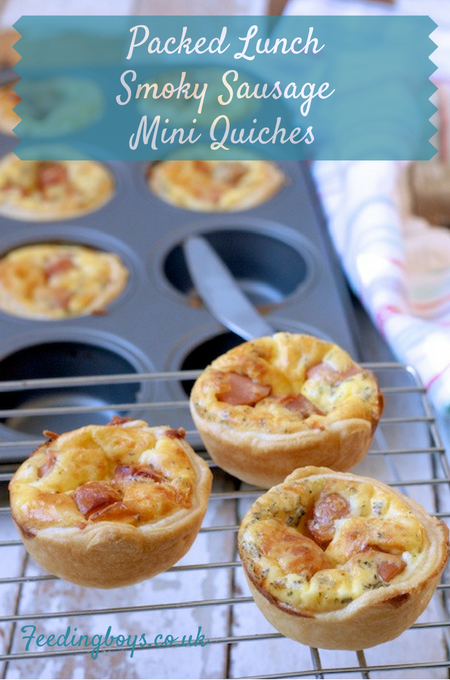 I love all of your tips on making these cute lunchbox quiches. I bet they are popular with your boys – big and small! These look ace! I also use ready made pastry often as it’s just so convenient and makes this kind of recipe so much quicker! Going to give this a go Katie. Thought they’d go nice with a glass of wine on Christmas Eve !! Heheh thanks Rosie… oh yes what a GREAT idea!